In 2016, total net emissions of carbon dioxide equivalent (CO2e) from Canada’s managed forests (forest lands managed for timber production) were about 78 million tonnes (Mt), meaning that they were a net source of emissions. Total net emissions are calculated by adding emissions/removals caused by human activities in Canada’s managed forests to emissions/removals caused by large-scale natural disturbances in Canada’s managed forests. The area burned in managed forests in 2016 was 0.77 million hectares (ha), about half of the area burned in 2015. This decrease resulted in lower emissions than in 2015, mainly because of the smaller total area burned. The impacts of the mountain pine beetle in British Columbia continued to decline, and insect damage in Canadian forests in 2016 was relatively minor, although spruce budworm impacts in eastern Canada are reflected in the current emissions estimates. Canada’s 2018 National Inventory Report 1990–2016 (from which these results are derived) has implemented a new approach for estimating and reporting on emissions and removals resulting from human activities in managed forests. Please see the textbox titled A new approach to reporting for more information about these changes. Under the United Nations Framework Convention on Climate Change (UNFCCC), Canada must report annually on greenhouse gas emissions from the managed forest. The “managed forest” is made up of all forests under direct human influence. It’s a subset of Canada’s total forest area and includes forests managed for harvesting, forests subject to fire or insect management, and protected forests, like those found in national and provincial parks. The data in this indicator is consistent with UNFCCC reporting. More information about definitions and methods can be found in Canada’s 2018 National Inventory Report 1990–2016. Table displays the greenhouse gas emissions or removals in Canada’s managed forests due to forest management activities in million tonnes of carbon dioxide equivalent per year for each year between 1990 and 2016. A positive number indicates a net emission of carbon dioxide in Canada’s managed forests for that year, while a negative number indicates a net removal. The table also displays the area of forestry activities in Canada’s managed forest in hectares. In Canada’s managed forests, forest management activities, such as harvesting, slash pile burning and regeneration, as well as the use and disposal of harvested wood products, were a net sink of about 20 Mt CO2e in 2016. Table displays the greenhouse gas emissions or removals in Canada’s managed forests due to natural disturbances in million tonnes of carbon dioxide equivalent per year for each year between 1990 and 2016. A positive number indicates a net emission of carbon dioxide in Canada’s managed forests for that year, while a negative number indicates a net removal. The table also displays the area of forest disturbed in hectares for each year between 1990 and 2016 by each of two causes: (1) wildfire and (2) insects. Natural disturbances in Canada’s managed forests resulted in emissions of about 98 Mt CO2e in 2016. 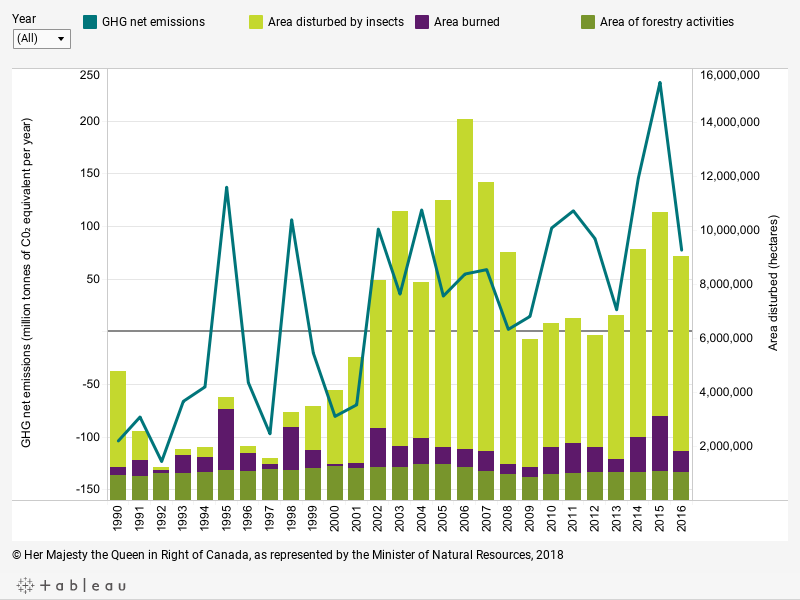 Forest GHG emissions were much lower than in 2015, in large part because of the smaller area burned than in 2015 and the continued decline of the mountain pine beetle outbreak in British Columbia, although spruce budworm is beginning to have an impact in eastern Canada. Table displays the greenhouse gas emissions or removals in Canada’s managed forests in million tonnes of carbon dioxide equivalent per year for each year between 1990 and 2016. A positive number indicates a net emission of carbon dioxide in Canada’s managed forests for that year, while a negative number indicates a net removal. The table also displays the area of forest disturbed in hectares for each year between 1990 and 2016 by each of three causes: (1) forest management, (2) wildfire and (3) insects. The total net emissions and removals from Canada’s managed forests, taking into account both human activities and natural disturbances, were about 78 Mt CO2e (–20 + 98 = 78) in 2016. This includes emissions from wood harvested in Canada and used in Canada and abroad. Changes in forest management and the use of harvested wood products can help mitigate the impacts of climate change. Natural disturbances, mostly outside the control of humans, significantly affect the ability of Canada’s managed forest to consistently absorb more CO2 than it emits. Carbon as carbon dioxide (CO2) in the atmosphere is an important contributor to global warming. 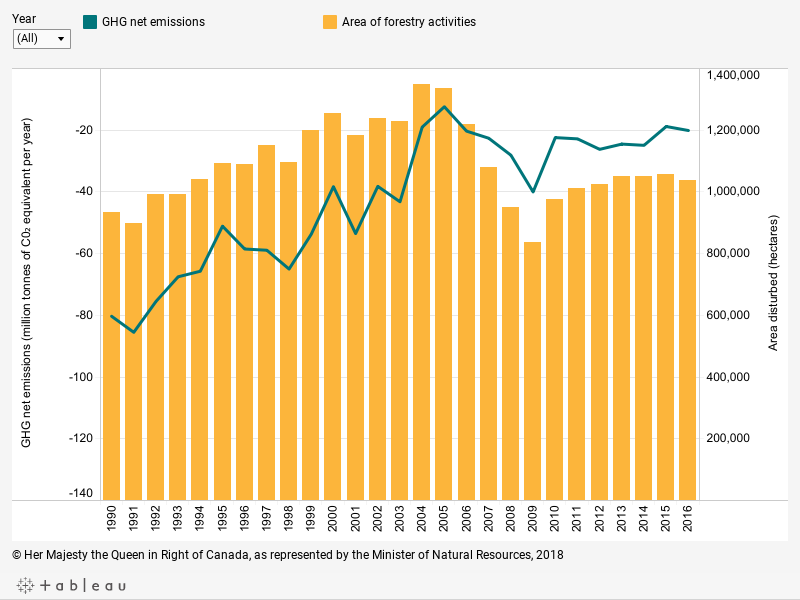 Canada’s forest sector contributes to both emissions and removals of CO2 from the atmosphere; however, in 2016, Canada’s managed forests were a net source of CO2. The impacts of climate change on Canada’s future forest GHG balance are difficult to predict. Regionally, impacts can be both positive (enhanced forest growth and therefore greater carbon sinks) and negative (higher mortality, more forest fires, more insect outbreaks). Given the larger-than-usual extent of area burned in 2017, especially in British Columbia, we expect emissions of GHGs to be similar to those reported in 2015. Increased use of long-lived wood products to store carbon in the built environment and use of wood products instead of emissions-intensive building materials provide opportunities for climate change mitigation. Canada’s National Forest Carbon Monitoring, Accounting and Reporting System provides annual estimates of the greenhouse gas balance for Canada’s managed forests. 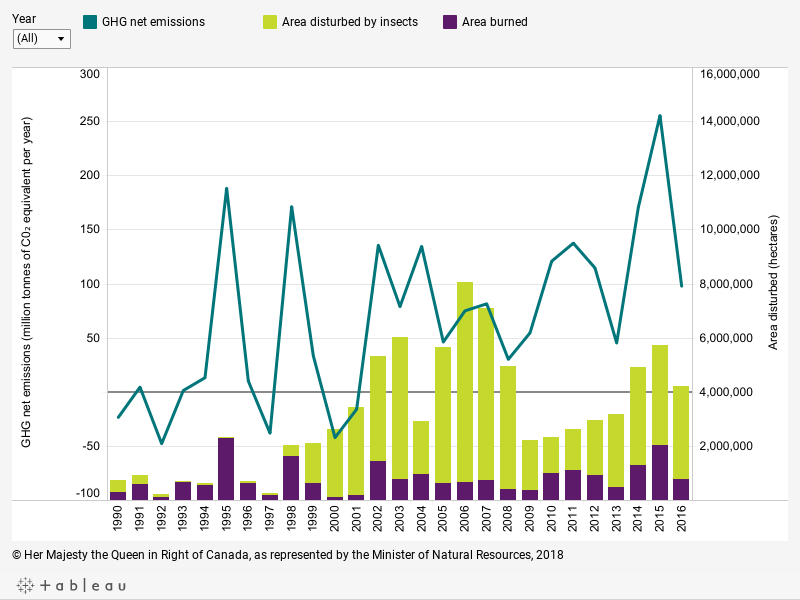 These estimates of emissions and removals are reported annually in Canada’s National Inventory Report to the United Nations Framework Convention on Climate Change. In previous years, estimates of carbon emissions and removals from Canada’s managed forests displayed large year-over-year variability because natural disturbances, especially forest fires, masked the subtler impacts of human forest management activities. The Intergovernmental Panel on Climate Change (IPCC) recognized this challenge for countries like Canada, which are interested in better understanding emissions due to human activities but where these impacts are difficult to see when combined with natural disturbances. Therefore, the IPCC recommended that countries develop new approaches to separate emissions and removals caused by human activities (anthropogenic partition) from emissions and removals caused by natural disturbances (natural partition). This separation of human-caused emissions and removals from natural disturbance-caused emissions and removals makes it possible to detect trends in emissions attributable to forest management. This enhances Canada’s ability to monitor and report on the consequences of climate change mitigation efforts by the forest sector. Details of the new approach, which has been in use since 2017, including definitions and methods, are provided in sections A3.5.2.3 Part 2 of Canada’s 2018 National Inventory Report 1990–2016. Environment and Climate Change Canada. 2018. National Inventory Report 1990–2016: Greenhouse gas sources and sinks in Canada (accessed April 13, 2018). This indicator is estimated annually using Natural Resources Canada–Canadian Forest Service’s National Forest Carbon Monitoring, Accounting and Reporting System. The system integrates information about forest inventories, forest growth, natural disturbances, forest management activities and land-use change to evaluate carbon stocks, stock changes and emissions of non-CO2 greenhouse gases in Canada’s managed forests. The system also estimates transfers to the forest product sector and the fate of harvested wood products manufactured from wood harvested in Canada since 1900, including carbon storage and emissions resulting from these products regardless of where in the world these emissions occur. “Managed land” includes all lands managed for production of wood fibre or wood-based bioenergy, for protection from natural disturbances, or for the conservation of ecological values. Within those managed lands, “forest” includes all areas of 1 hectare or more having the potential to develop forest cover, with a minimum crown closure of 25% and a minimum tree height of 5 metres at maturity in situ. Insect-affected areas in the second figure includes only those areas assigned to the natural partition where tree mortality due to insects exceeded 20% of biomass, while in the third figure all areas affected by insects are shown (anthropogenic and natural partitions). When stands are affected by stand-replacing wildfires, the emissions and subsequent removals during post-fire regrowth are reported in the category of “natural disturbances.” When regrowing stands reach commercial maturity, the emissions and removals are reported in the “management activity” category. Stands affected by partial disturbances that cause more than 20% mortality are reported in the “natural disturbance” category until the biomass reaches pre-disturbance levels. Harvested wood product emissions are estimated using the “production approach” of the Intergovernmental Panel on Climate Change (IPCC) and include annual emissions from all wood harvested in Canada since 1900, regardless of its current location. Transfers of wood and paper products to landfills are assumed to instantly oxidize as CO2. For forest lands affected by land-use change, the deforestation and afforestation figures reflect annual rates. Figures for CO2 equivalent (CO2e) emissions and removals reflect the current year plus the emissions in the reporting year from lands that were converted from forest in the previous 20 years. Thus, the figures for CO2e emissions include residual emissions from areas deforested over the past 20 years, and the figures for CO2e removals in the reporting year include removals by all areas afforested over the past 20 years. Emissions bear a positive sign. Removals bear a negative sign. Starting in 2015, international greenhouse gas (GHG) reporting guidelines changed with respect to harvested wood products. Accordingly, Canada reports the net GHG balance of forested ecosystems and the net GHG balance from harvested wood products. In previous years, all wood removed from the forest was assumed to instantly release all carbon to the atmosphere, despite the long-term storage of carbon in houses and other long-lived wood products. Reporting the fate of carbon in harvested wood products encourages both the sustainable management of forests and the management of harvested wood products aimed at extending carbon storage. Kurz, W.A., Shaw, C.H., et al. 2013. Carbon in Canada’s boreal forest: A synthesis. Environmental Reviews 21, 260–292. Lemprière, T.C., Kurz, W.A., et al. 2013. Canadian boreal forests and climate change mitigation. Environmental Reviews 21, 293–321. Metsaranta, J.M., Shaw, C.H., et al. 2017. Uncertainty of inventory-based estimates of the carbon dynamics of Canada's managed forest (1990–2014) Canadian Journal of Forest Research 47, 1082–1094. Natural Resources Canada–Canadian Forest Service. Carbon budget model (accessed April 3, 2018). Natural Resources Canada–Canadian Forest Service. Inventory and land-use change (accessed May 3, 2017). Stinson, G., Kurz, W.A., et al. 2011. An inventory-based analysis of Canada’s managed forest carbon dynamics, 1990 to 2008. Global Change Biology 17, 2227–2244.